It is well-documented that I love almond paste and making cookies with it. It is just a quick way to chewy-cookie heaven, with a pungent dose of aromatic almond flavor thrown into the bargain. 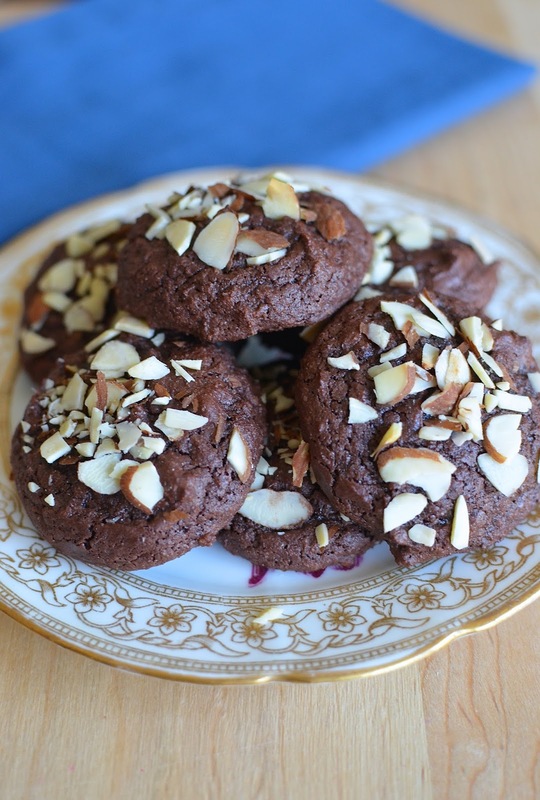 I was watching Giada De Laurentiis make chocolate amaretti cookies on her show the other day and turns out, it's the almond paste (or "macaroon") cookies I make all the time, with a dose of cocoa thrown in. Sounds great! Of course, I need to make a chocolate version of my favorite chewy almond cookies so I got right into the kitchen to do just that. Giada uses a food processor but I made these cookies in the stand mixer like I usually do because the mixer is sitting right on my kitchen counter whereas the heavy food processor is wedged into a corner of the pantry downstairs. It works out just fine whichever equipment you use. It's just a matter of breaking down the almond paste with some sugar and dark cocoa in this case. Egg whites bind the whole thing together, without the need for any flour in these recipes. You could add some orange zest if you like but I kept it as is. I had a vague concern that the cocoa might mask the almond flavor too much so I tossed in a few drops of almond extract; turns out, that wasn't really necessary but a little extra almond insurance doesn't hurt as long as you don't go overboard. I topped the cookies with a sprinkle of coarsely chopped sliced almonds for a little bit of crunch without using more sugar. These cookies are naturally sweet but they do beg for a little decoration on top. And I can tell you these chocolate amaretti cookies were delicious, being the familiar almond paste cookies I know and love. You've got a ton of sticky chewiness in every bite. The edges are just a little crisp giving way to a very chewy center. The cocoa or chocolate flavor is actually not very strong. I think it nicely tempers some of the sweetness of the almond paste and gives you a hint of cocoa but while they look dark and chocolaty, the almond flavor and chewy texture remain the star of the show. I'm very good with that. When I make almond paste cookies like these, I just try to be patient and let the mixer break up the almond paste as much as possible (Giada's way of using the food processor definitely makes sense if you prefer that route). Once the almond paste, sugar, and cocoa mixture gets crumbly, you can gradually add the egg whites and mix until it comes together in a very sticky paste. I like to use a small ice cream scoop that's just a bit over 1 tablespoon in measure. That way, you should get 2 dozen of these cookies following the recipe (for a quick nibble, I often divide the recipe in half for an even dozen to munch on with my family). You want to bake these until they just puff up, feel set, start to crack on the surface but are still soft in the center. Let the cookies cool completely on the baking sheet over a wire rack before removing the cookies. If you try to remove them too soon, the bottoms will stick. These types of almond paste cookies are some of my favorite things. I love to grab a few as a treat in the evenings. If you like chewy cookies and almonds, these are so wonderful. Place oven racks in the upper and lower third of the oven and preheat to 375 degrees. Line 2 baking sheets with silicon mats or parchment paper. Break almond paste into small pieces and place in the bowl of a stand mixer (alternatively, you can use a food processor). Add sugar, cocoa, and salt. Beat on medium-speed until mixture is crumbly - this could take 2-3 minutes. Gradually add the egg whites, vanilla, and almond extract if using, beating until a smooth and sticky dough comes together. Use a small ice cream scoop or a tablespoon measure to drop cookie dough onto prepared baking sheets, setting cookies about 2 inches apart. Top cookies with a sprinkle of the chopped sliced almonds, pressing down lightly. Bake cookies for about 12-14 minutes, or until puffed and just beginning to crack on the surface but still soft in the center. Remove and place baking sheets onto wire racks. Let cookies cool completely before removing from the baking sheets (otherwise, the bottoms will stick). Store cooled cookies in an airtight container for up to 3 days. Lucky me having all the ingredients for these wonderful cookies! Chocolate and almonds are super together in baked goods. This recipe sound quite easy and quick and the result is marvelous, Monica. Totally...I love chocolate and almonds (most nuts) together! These are so easy to make and guaranteed to be good if you like a chewy cookie. Thank you! The almond paste is just a great shortcut - great flavor and you get such a moist and chewy texture. There was just something about that dark cocoa giving these an edge. I love grabbing my almond paste and making these cookies - quick and always satisfying. Now, I'll be tossing in cocoa every so often. Wow! These are gorgeous! My favourite cookies and then you added chocolate to them. Need I say more? "Stores up to 3 days" who needs three days! You knew this would speak to me and I guess you made these just for me! Do you need my address? Seriously - they sound wonderful and I have to try the cocoa almond paste combo - yummy! 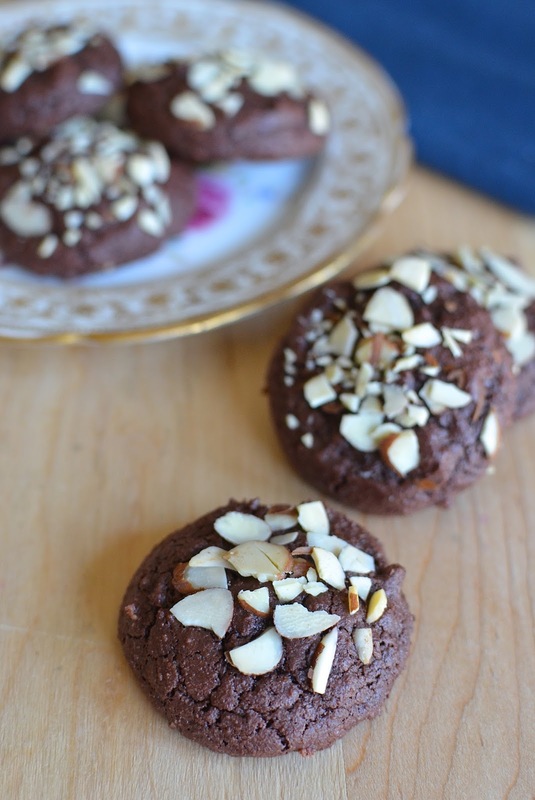 I've made amaretti cookies before but never thought of making a chocolate version! This looks sooooo delicious! Same here...I make these all the time and usually just switch up the toppings - almonds, pine nuts, candied cherries...The cocoa powder is a great addition. Chocolate? Almonds? Cookies? And chewy? Yes please! That is a match made in heaven. I just made green tea ones the other day and so totally addictive, must make a chocolate version now. Green tea ones!! That's another I haven't made. Love that! My sister would especially enjoy it. I totally can believe that, Lorraine! I've been craving some cinnamon buns with almond paste again, and I have to make some soon. I just love pastries with it. Chocolate and almonds are such a good combination. I love the aroma (and the flavour) of almonds too. These cookies sound amazing! I know it's not the point, but I want to say, you have such lovely dishes and linens. Almond paste is like a short cut or secret ingredient to so much dessert/pastry goodness, Juliana! : ) Hope you're having a good week! Chocolate and amaretti in the same cookie, oh my it is going to be difficult to have self control around these delicious bites. Love the addition of nuts on top and they are so pretty. Pinning and sharing! These look so delicious, Monica! I'm a huge fan of almond anything too, so I can just imagine how wonderful these are. So lovely!